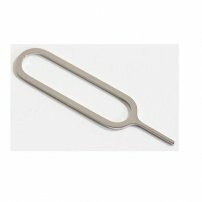 SIM Card Ejector Tool / SIM Card Tray Eject Pin for iPhone / iPad Air / iPad Mini / iPad Pro / Phone Apple iPhone / iPad SIM card removal pin [AP000988] - $0.95 : allputer.com - Accessories for all your Portable Electronics & Computers! It is exactly as your original SIM Eject tool bundled with your iPad / iPhone. - This is also compatible with other phones.